The canton of Lucerne (German: Kanton Luzern) is a canton of Switzerland. It is located in the centre of Switzerland. The population of the canton (as of 31 December 2017) is 406,506. As of 2007[update], the population included 57,268 foreigners, or about 15.8% of the total population. The cantonal capital is Lucerne. The oldest traces of humans in the Lucerne area are stone artifacts and cave bear bones found in the Steigelfadbalm cave on Mt. Rigi from the Middle Paleolithic or about 30,000 BC. Other animal bones including mammoth, reindeer and giant deer from the local glacial maximum have also been found in the canton. Around 17,000 BC the glaciers disappeared from the Swiss plateau and recolonization is likely at that time. 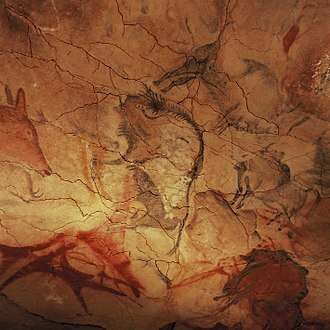 The first Paleolithic and Mesolithic settlement discovered in the canton is in the Wauwilermoos, which is now a Swiss heritage site of national significance. A number of other settlements have since been found, mainly on sandy, dry elevations in the immediate vicinity of water. The settlements of Egolzwil 3 in Wauwilermoos in Egolzwil, Seematte at Hitzkirch and Halbinsel in Sursee are part of the Prehistoric Pile dwellings around the Alps a UNESCO World Heritage Site. The Wauwilermoos houses had wooden or bark floors and hearths of clay. The villages had ceramic vessels and wood, bone, antler, stone and flint tools as well as textiles. Copper ax blades and knives provide the first evidence of metal use in Switzerland. Imported mollusks show that there were trade connections to the Mediterranean. The bones at Egolzwil 3 are over two thirds from domestic animals with the remainder from wild animals. The main domesticated animals were sheep, goats and pigs with only a few domestic cattle. The animals hunted included deer, roe deer, wild boar and elk. 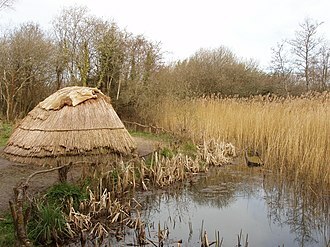 During the Bronze Age the canton was quite settled. There were a number of settlements on the shores of Lake Sempach and Lake Baldegg along with hilltop settlements, graves and scattered items throughout the area. At Hochdorf-Baldegg a fenced village from the early Bronze Age (2200–1500 BC) was uncovered. The single-story houses all had clay or stone hearths. 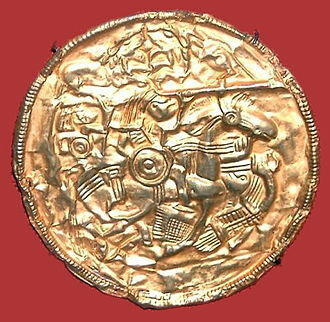 During the Middle Bronze Age (1550–1350 BC) most of the villages were not located directly on the lake shores. 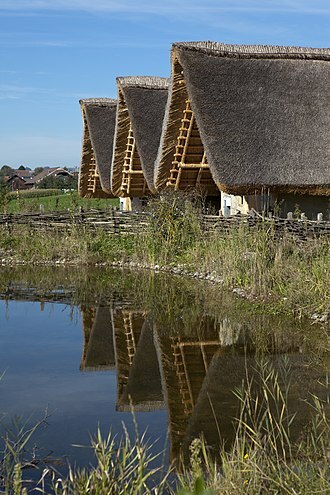 The Late Bronze Age settlement at Sursee-Zellmoos on Lake Sempach featured houses arranged in rows with mortared stone. The walls were timber lined with clay. Another Late Bronze Age settlement near the village of Schötz was densely populated between 1350 and 800 BC. 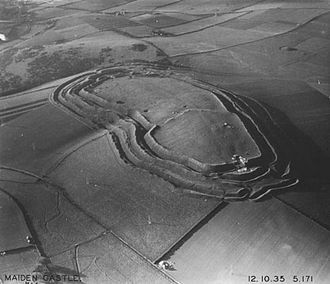 While numerous individual Iron Age items have been found, almost no settlements have been discovered. From the Hallstatt period (800–480 BC) mainly graves have been discovered. Very little is known about the La Tène period (480–30 BC) in Lucerne. Some iron tools, gold coins, ceramic vessels and a glass bangle as well as a burial ground with at least four graves have been found. During the Roman era, the canton was once again thickly settled. A number of farms were built in the north-south running valleys (Wigger, Suhre, Wyna and See valleys). 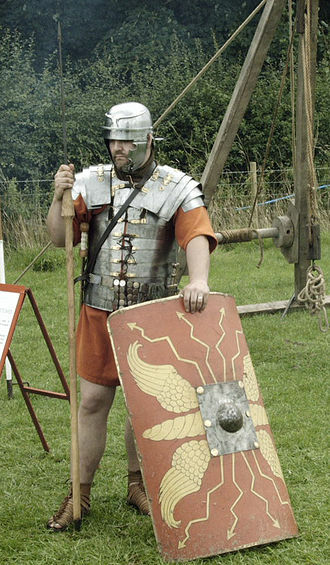 During the 1st century AD, the farms provided food for the Legion camp in Vindonissa and for the larger settlements located in the Swiss plateau. Towards the end of the 1st century there was a vicus at Sursee. The remains of houses show that there were a number of small shops and manufacturing buildings in the town. 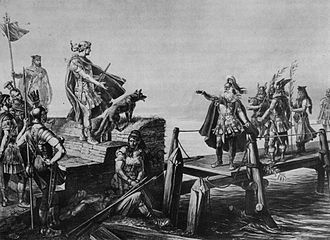 The west bank of the Suhre was fortified with a stone slip and may have served as a ship or raft berth. Imports from various regions of the Roman Empire (southern Spain, southern Italy, Lipari, southern and eastern Gaul and the Germanic areas) provide evidence of extensive trade relations. Sursee was likely a freight hub for trade with the entire Alpine region. Following the collapse of the Roman Empire, the canton of Lucerne was settled by the Alamanni, who generally settled away from the Roman settlements. Some exceptions include a Roman manor at Büron and the Roman town of Sursee. An Alamannic grave field was found at Aesch with 61 graves with wooden coffins from before the 7th century before. 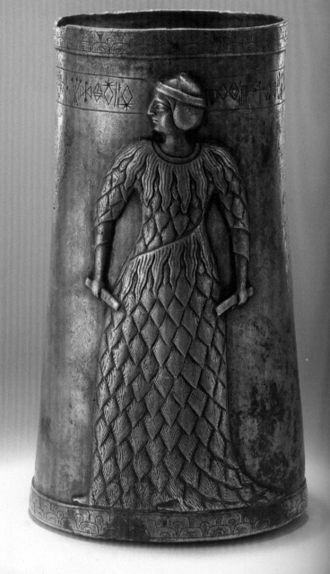 In the women's graves there were necklaces with glass and amber beads, while swords were found in the men's graves. 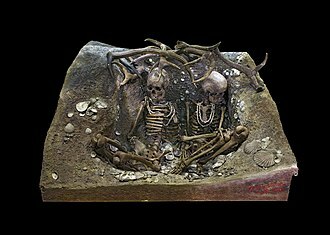 Belt buckles and small iron knives were found in the graves of both sexes. A few items from the southern Alpine region, southern Germany and Burgundy indicate that trade continued. Two early medieval stone grave vaults, both of which were used for multiple burials, were found in the church of Altishofen. In the treasury of Beromünster Abbey there is a 7th-century ornate reliquary of gilded copper plates, which probably came from northern Italy. 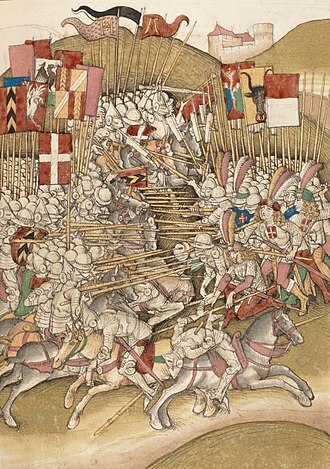 The Battle of Sempach (1386) near Sempach (which while allied wouldn't become part of the canton for 8 more years) drove the Habsburgs out of the region and strengthened the Confederation. That victory led also to the gradual acquisition of territory ruled by and from the town. Amstalden, a wealthy innkeeper Schüpfheim in the Entlebuch valley of the canton of Lucerne, was the leader of a planned rebellion of the valley against the city of Lucerne. In a plot to limit the power of the city, officials from the neighbouring canton of Obwalden had promised their support. The conspiracy was detected before they could stage the planned coup. On 24 August 1478, Amstalden was arrested, tortured and interrogated, and finally beheaded in November 1478. During the Reformation Lucerne remained attached to Roman Catholicism, of which ever since it has been the great stronghold in Switzerland. The papal nuncio resided here from 1601 to 1873. In the 16th century, during the early modern age, the town government fell into the hands of an aristocratic oligarchy, whose power, though shaken by the Swiss peasant war of 1653 in the Entlebuch, lasted until 1798. Under the French-supported Helvetic republic (1798–1803) Lucerne was the seat of the central government. When the republic collapsed, under the Act of Mediation (1803) it was one of the six "Directorial" cantons and during the Restoration (from 1815 to 1848) it was one of the three ruling cantons. The patrician government was swept away by the cantonal constitution of 1831. But in 1841 the Conservatives regained power. They quickly recalled the Jesuits, who had been expelled by earlier radical governments, to head the cantonal school system. The riots that followed brought about the Sonderbund War (1847) in which the Conservatives were defeated, the decisive battle taking place at Gisikon, not far from Lucerne. The canton of Lucerne is part of Central Switzerland. The lands of the canton lie on the northern foothills of the Swiss Alps (Urner Alps). The highest elevation of the canton of Lucerne is at the Brienzer Rothorn at 2,350 m (7,710 ft). It borders the cantons of Obwalden and Nidwalden to the south, Schwyz and Zug to the east, Aargau to the north, and Berne to the west. Its territory corresponds to the subject territories acquired by the city of Lucerne during the 14th and 15th centuries, including: Lucerne proper at the outflow of the Reuss river from Lake Lucerne; the stretch of the Reuss river between Lucerne and Honau, along Rooterberg hill (connecting to Lake Zug with the territory of Meierskappel municipality); the Kleine Emme basin (including its tributaries Entle and Rümlig); the tributaries of the Aare between Napf and Lindenberg, including (west to east) Wigger, Suhre (Lake Sempach), Wyna, Aabach (Lake Hallwil, Lake Baldegg); two territories connected only by water, across Lake Lucerne: the northern slope of Bürgenstock (part of Lucerne municipality), and the municipalities of Greppen, Weggis and Vitznau on the western and south-western slopes of Mount Rigi. The area of the canton is 1,493 km2 (576 sq mi). 817.7 km2 (315.7 sq mi), about 55% of the total land area, is used for agriculture. An additional 449.0 km2 (173.4 sq mi) (about 30%) of the canton is wooded. The remainder of the canton is either developed, 125.3 km2 (48.4 sq mi) (8.4%), or unproductive (lakes, rivers or mountains), 101.5 km2 (39.2 sq mi) (6.8%). 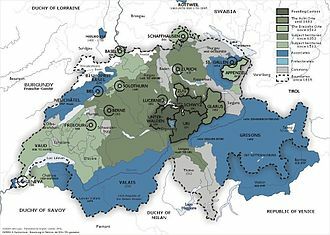 The Canton is divided into six districts (Wahlkreise): Entlebuch, Hochdorf, Luzern-Land, Luzern-Stadt, Sursee, Willisau. Before 2007, the districts were called Ämter. There were five districts until 2013, when Luzern District was divided into Luzern-Land and Luzern-Stadt, the latter corresponding to the city of Lucerne proper (including Littau, incorporated into Lucerne in 2010). There are 83 municipalities in the canton (As of 2016[update]). The Constitution of Lucerne of 2007 entered into force on 1 January 2008, replacing the 1875 constitution. With the new constitution, the legislative body Grosser Rat (Grand Council) was renamed to Kantonsrat (Cantonal Council). It is composed of 120 members elected by proportional representation. The executive body is the Regierungsrat (Government Council), composed of 5 members. The Christian Democratic People's Party (CVP) is traditionally the largest party, having won 38 seats in the Cantonal Council as of the 2015 elections, and having two out of five members in the Government Council as of 2016[update]. Lucerne has a population (as of December 2017[update]) of 406,506. As of 2013[update], 18.1% of the population are resident foreign nationals, of which 15.5% are from Europe, 1.4% from Asia, 0.7% from Africa, and 0.5% from America. Over the last 10 years (2000–2010) the population has changed at a rate of −0.4%. Migration accounted for −1.2%, while births and deaths accounted for 1.3%. Most of the population (as of 2010[update]) speaks German (91%) as their first language, while Serbo-Croatian, Italian, Albanian and English are the second most common languages (3%), followed by Portuguese and French with 2% each, and Spanish with 1%. Of the population in the canton, 115,233 or about 32.9% were born in Lucerne and lived there in 2000. There were 101,980 or 29.1% who were born in the same canton, while 66,486 or 19.0% were born somewhere else in Switzerland, and 55,314 or 15.8% were born outside of Switzerland. As of 2000[update], children and teenagers (0–19 years old) make up 25% of the population, while adults (20–64 years old) make up 58.6% and seniors (over 64 years old) make up 16.4%. As of 2000[update], there were 158,345 people who were single and never married in the canton. There were 159,152 married individuals, 18,853 widows or widowers and 14,154 individuals who are divorced. As of 2000[update], there were 13,430 private households in the canton, and an average of 2.5 persons per household. There were 47,012 households that consist of only one person and 12,952 households with five or more people. As of 2009[update], the construction rate of new housing units was 4.7 new units per 1000 residents. As of 2003[update] the average price to rent an average apartment in Lucerne city was 1150.31 Swiss francs (CHF) per month (US$920, £520, €740 approx. exchange rate from 2003). The average rate for a one-room apartment was 646.07 CHF (US$520, £290, €410), a two-room apartment was about 879.64 CHF (US$700, £400, €560), a three-room apartment was about 1033.60 CHF (US$830, £470, €660) and a six or more room apartment cost an average of 2032.38 CHF (US$1630, £910, €1300). The average apartment price in Lucerne was 103.1% of the national average of 1116 CHF. The vacancy rate for the canton, in 2010[update], was 0.77%. The largest population centres are Lucerne, Emmen and Kriens. Much of the land in the canton is used for agriculture. Agriculture is the most significant source of income, but industry is also developed. The most important agricultural products are crops, fruit and cattle breeding. Industry concentrates on textiles, machinery, paper, wood, tobacco and metallurgical goods. As of 2010[update], Luzern had an unemployment rate of 1.4%. As of 2008[update], there were 1,764 people employed in the primary economic sector and about 703 businesses involved in this sector. 5,388 people were employed in the secondary sector and there were 324 businesses in this sector. 9,431 people were employed in the tertiary sector, with 1,113 businesses in this sector. In 2008[update] the total number of full-time equivalent jobs was 160,133. The number of jobs in the primary sector was 9,608, of which 9,462 were in agriculture, 119 were in forestry or lumber production and 27 were in fishing or fisheries. The number of jobs in the secondary sector was 48,191 of which 31,698 or (65.8%) were in manufacturing, 142 or (0.3%) were in mining and 14,990 (31.1%) were in construction. The number of jobs in the tertiary sector was 102,334. In the tertiary sector; 25,105 or 24.5% were in the sale or repair of motor vehicles, 8,182 or 8.0% were in the movement and storage of goods, 8,146 or 8.0% were in a hotel or restaurant, 3,835 or 3.7% were in the information industry, 7,000 or 6.8% were the insurance or financial industry, 10,979 or 10.7% were technical professionals or scientists, 8,111 or 7.9% were in education and 15,924 or 15.6% were in health care. From the 2000 census[update], 248,545 or 70.9% were Roman Catholic, while 39,426 or 11.2% belonged to the Swiss Reformed Church. Of the rest of the population, there were 7,801 members of an Orthodox church (or about 2.23% of the population), there were 471 individuals (or about 0.13% of the population) who belonged to the Christian Catholic Church, and there were 7,564 individuals (or about 2.16% of the population) who belonged to another Christian church. There were 399 individuals (or about 0.11% of the population) who were Jewish, and 13,227 (or about 3.77% of the population) who were Islamic. There were 875 individuals who were Buddhist, 1,715 individuals who were Hindu and 293 individuals who belonged to another church. 20,681 (or about 5.90% of the population) belonged to no church, are agnostic or atheist, and 13,007 individuals (or about 3.71% of the population) did not answer the question. In Luzern about 127,331 or (36.3%) of the population have completed non-mandatory upper secondary education, and 42,391 or (12.1%) have completed additional higher education (either universities or a Fachhochschule). Of the 42,391 who completed tertiary schooling, 65.0% were Swiss men, 23.6% were Swiss women, 7.0% were non-Swiss men and 4.4% were non-Swiss women. Institutions of higher education include the Lucerne University of Applied Sciences which also has campuses in Lucerne and Horw. ^ "Lucerne (Canton)". Encyclopædia Britannica. 17. 1911. p. 97. Retrieved 2009-04-18. ^ "KGS-Inventar". KGS Inventar (in German). Federal Office of Civil Protection. 2009. Archived from the original on 28 June 2010. Retrieved 12 July 2010. ^ a b c d e Lucerne in German, French and Italian in the online Historical Dictionary of Switzerland. ^ "Lucerne (City)". Encyclopædia Britannica. 17. 1911. p. 97. Retrieved 2009-04-18. ^ "Amtliches Gemeindeverzeichnis der Schweiz". Swiss Federal Statistical Office. Retrieved 27 July 2016. ^ a b "Ausländische Personen nach Nationalität und Status Ende 2013 - Kanton Luzern". www.lustat.ch (Database excerpt) (in German). lustat - Statistik Luzern, Kanton Luzern. 18 August 2014. Retrieved 2014-11-23. ^ "Wohnbevölkerung nach Hauptsprachen seit 2010 - Kanton Luzern". www.lustat.ch (Database excerpt) (in German). lustat - Statistik Luzern, Kanton Luzern. 10 March 2014. Retrieved 2014-11-23. Wikimedia Commons has media related to Canton of Lucerne. Canton of Lucerne in German, French and Italian in the online Historical Dictionary of Switzerland. Sursee is a municipality in the district of Sursee in the canton of Lucerne, Switzerland. Sursee is located at the end of Lake Sempach, not far from where the Sure river exits the lake. 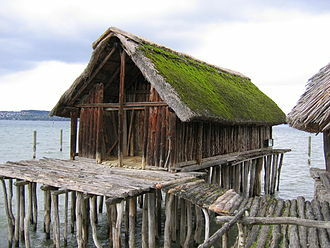 The shores of Lake Sempach have been inhabited since the Neolithic, Sursee municipality is home to the Halbinsel prehistoric pile-dwelling settlement that is part of the Prehistoric Pile dwellings around the Alps UNESCO World Heritage Site. Halbinsel was settled a number of times during the Neolithic and Bronze Age, at Zellmoos in the Halbinsel site, the bottom layer is from the Cortaillod culture while there are several Late Bronze Age layers above it. There are three Late Bronze Age layers at Gammainseli, the Zellmoos sites were discovered in 1806 and excavated in 1902,1941,1991 and 2005. The Bronze Age sites featured several houses with clay floors, a number of ceramic, bone and flint items were found in the excavation. The Gammainseli site has been known since the 19th century, and was explored by divers in 2005, who found Late Bronze Age potsherds, animal bones, some neolithic flints were found, but no trace of a settlement has been discovered. In the Roman era, there was a vicus just to the west of the town, in the 8th century, a wooden church was built around which the village gradually developed. The wooden church was replaced by stonework in c, an Alamannic cemetery and the remains of another early medieval church were excavated to the north-east of the town. The first mention as Surse dates to 1036, as Ulrich I of Lenzburg gave the village to Beromünster abbey, the village grew into a small town in the 13th century, granted city rights by the Dukes of Austria in 1299. Sursee was conquered by Lucerne in 1415, and managed to retain its city rights under the new lordship, in the 19th century, the furnace-factory Ofenfabrik Sursee grew to be the largest employer. By 1950, Sursee was affected by uncontrolled growth and today faces the problems of many agglomeration cities, but during the 1990s, authorities tried to guide the growth in a more controlled, higher quality direction. In 2003, the Wakker Prize was awarded to Sursee for the development, Sursee was awarded the prize for their efforts to control and direct the formerly uncontrolled expansion while avoiding turning the historic old city into a museum or an empty show piece. The cave bear was a species of bear that lived in Europe and Asia during the Pleistocene and became extinct about 24,000 years ago during the Last Glacial Maximum. Both the word cave and the scientific name spelaeus are used because fossils of species were mostly found in caves. This reflects the views of experts that cave bears may have spent more time in caves than the brown bear, Cave bear skeletons were first described in 1774 by Johann Friederich Esper in his book Newly Discovered Zoolites of Unknown Four Footed Animals. 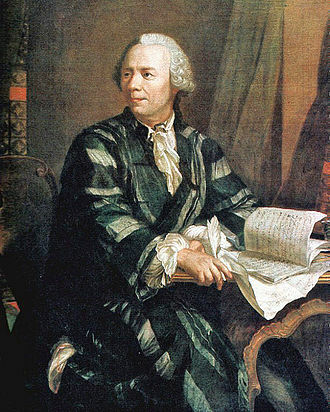 While scientists at the time considered that the skeletons could belong to apes, felids, or even dragons or unicorns, twenty years later, Johann Christian Rosenmüller, an anatomist at the Leipzig University, gave the species its binomial name. 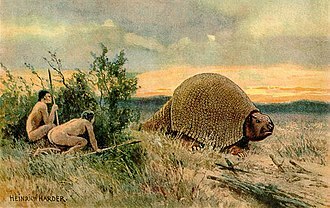 The bones were so numerous that most researchers had little regard for them, during World War I, with the scarcity of phosphate dung, earth from the caves where cave bear bones occurred were used as a source of phosphates. When the dragon caves in Austrias Steiermark region were exploited for this purpose, only the skulls, many caves in Central Europe have skeletons of cave bears inside, for example the Heinrichshöhle in Hemer, the Dechenhöhle in Iserlohn, Germany. 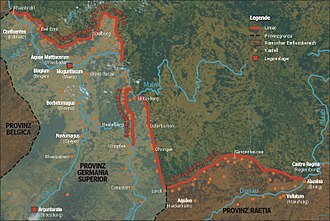 A complete skeleton, five complete skulls, and 18 other boness were found inside Jaskinia Niedźwiedzia in 1966 in Poland, in Romania, in a cave called Bears Cave,140 cave bear skeletons were discovered in 1983. 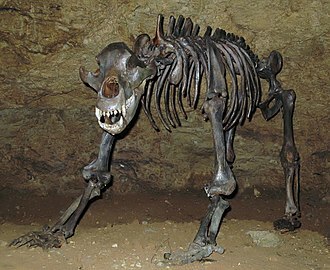 Both the cave bear and the bear are thought to be descended from the Plio-Pleistocene Etruscan bear that lived about 5.3 Mya to 10,000 years ago. The last common ancestor of cave bears and brown bears lived between 1.2 and 1.4 Mya. 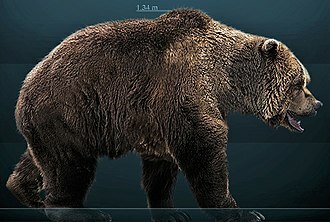 The immediate precursor of the bear was probably Ursus deningeri. Ursus spelaeus deningeroides, while other authorities consider both taxa to be variants of the same species. Cave bears found in different regions vary in age, thus facilitating investigations into evolutionary trends, the three anterior premolars were gradually reduced, possibly in response to a largely vegetarian diet. In a fourth of the found in the Conturines, the third premolar is still present. The last remaining premolar became conjugated with the molars, enlarging the crown and granting it more cusps. The Reuss is a river in Switzerland. With a length of 164 kilometres and a basin of 3,426 square kilometres. The upper Reuss forms the valley of the canton of Uri. The course of the lower Reuss runs from Lake Lucerne to the confluence with the Aare at Brugg, the Gotthardreuss rises in the Gotthard massif, emerging from Lago di Lucendro in the canton of Ticino and passing into the canton of Uri at Brüggboden. The Furkareuss rises east of Furka Pass and forms the Urserental and Furkareuss join at Hospental. Downstream of Andermatt the Reuss passes through Schöllenen Gorge and under the legendary Devils Bridge, at Göschenen it is joined by the Göschenerreuss. The Reuss leaves Lake Lucerne some 20 km to the north-west, notable bridges in Lucerne are the Kapellbrücke, first built 1333, rebuilt 1993 and Spreuerbrücke, built 1408. A needle dam just upstream from the Spreuerbrücke) maintains the water level and it receives the Kleine Emme from Entlebuch at Emmen. It receives the Lorze from Lake Zug downstream of Maschwanden, downstream of this confluence, the Reuss forms the border between Aargau and Zürich, passing Merenschwand and Ottenbach, and enters Aargau downstream of Ottenbach. Within Aargau, the Reuss flows past Aristau, Rottenschwil, Hermetschwil-Staffeln, here forming Flachsee, the Reussbrücke at Bremgarten was first built c. After the confluence the river continues as the Aare, which flows into the Rhine at Koblenz, the catchment area of 3,426 km2 approximately covers Central Switzerland. The catchment area of the upper Reuss includes almost the entire canton of Uri (with the exception of Urnerboden, the highest point of the drainage basin is the summit of Dammastock, at elevation 3,630 m. Downstream of Lucerne, further tributaries add other parts of Zug as well as parts of Zürich, the Germanic name is attested as Rusa, Rusia from the 9th century, from an early Germanic *Rūsi, oblique *Rūsjō-. Greule interprets the name as an Old European hydronym, directly cognate with Riß, until the 13th century, the Schöllenen Gorge was impassable, separating Urseren from Uri. Urseren was accessible via Furka and Oberalp, and was under the influence of the bishopric of Chur, the main settlement area of Uri was the plain of the Reuss estuary Altdorf. The Rigi is a mountain massif of the Alps, located in Central Switzerland. The whole massif is almost entirely surrounded by the water of three different water bodies, Lake Lucerne, Lake Zug and Lake Lauerz, the Rigi Kulm and other areas, such as the resort of Rigi Kaltbad, are served by Europes oldest mountain railways, the Rigi Railways. The whole area offers activities such as skiing or sledging in the winter. The name Rigi is from Old High German *rigî, from rîga row, furrow, the name is first recorded in 1350 as Riginun. The name was interpreted as Regina montium queen of mountains by Albrecht von Bonstetten, bonstettens interpretation as Regina was influential in the 17th century, and was still repeated in 18th-century travelogues. Karl Zay criticized this latinization, arguing for mons rigidus instead, in the 19th century, many authors repeated either rigidus or regina as the names supposed origin. The two possibilities were adduced as explanation the names grammatical gender alternating between masculine and feminine, brandstetter finally discredited these interpretations and established the origin in Old High German rîga. There are multiple transport options available to ascend Mt. Rigi, By rack railway from Arth-Goldau and Vitznau. 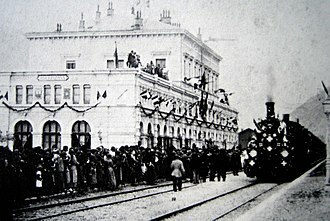 The Vitznau-Rigi-Bahn started operation on May 21,1871 and was the first mountain railway in Europe, on June 4,1875 the Arth-Rigi-Bahn was finished, allowing access from the other side of the mountain. They were electrified in 1937 and 1907 respectively, with the Arth-Rigi-Bahn becoming the first electrified standard gauge rack-railway in the world, both lines go all the way to the summit, Rigi Kulm. By gondola lift from Weggis to Rigi-Kaltbad, by cable-car from the Kräbel station on the Arth-Rigi-Bahn line to Rigi-Scheidegg. There are numerous public grilling stations located near the hiking trails, Rigi is a perfect destination for people practising winter sports and other winter recreation activities. Mt. Rigi has been featured in works of art. Perhaps the most famous paintings of the Rigi were a series by JMW Turner, including The Blue Rigi, mark Twain visited Rigi during his tour of Central Europe in the late 1870s, and wrote about his travels in chapter 28 of his A Tramp Abroad.